For other people named Joseph Gerard or a related name, see Joseph Gerard. Joseph Elliott Girardi (born October 14, 1964) is an American professional baseball manager for the New York Yankees of Major League Baseball (MLB). Formerly a catcher, Girardi played for the Chicago Cubs, the Colorado Rockies, the Yankees and the St. Louis Cardinals. In 2006, he managed the Florida Marlins and was named the National League Manager of the Year. Girardi, the fourth son of Jerry, a former blue collar worker and United States Air Force veteran, and Angela Girardi, was born in Peoria, Illinois and grew up in East Peoria, Illinois. He attended East Peoria's Neil Armstrong grade school; and Peoria's Sacred Heart/Father Sweeney, where he was coached in basketball by his father. He then attended Academy of Our Lady/Spalding Institute in Peoria, Illinois, where he played quarterback for the football team and catcher for the baseball team. He went on to play baseball at Northwestern University in Evanston, Illinois, where he earned a bachelor of science degree in industrial engineering. He was the first freshman to be elected president of a fraternity (Alpha Tau Omega) at Northwestern. The Chicago Cubs drafted Girardi in the fifth round of the 1986 Major League Baseball draft. He spent four seasons in the Cubs minor leagues system before making his major league debut. In 1986, Girardi batted .309 in 68 games with the Peoria Chiefs of the Midwest League. In 1989, he also played for the Águilas del Zulia in the Venezuelan Winter League. Girardi made his Major League debut for the Cubs on April 4, 1989. During his rookie year with the Cubs, Girardi batted .248 with a home run and 14 RBI in 59 games played. In 1990, he played in 133 games, batting .270 with a home run and 38 RBI. In 1991, he played in only 21 games, batting .191 with 6 RBI. In 1992, he played in 91 games, batting .270 with a home run and 12 RBI. The Cubs left Girardi unprotected in the 1992 expansion draft and the Colorado Rockies chose him. During his first year with the Rockies in 1993, he played in 86 games batting .290 with five triples, three home runs, and 31 RBI. In 1994, he played in 93 games batting .276 with four triples, four home runs, and 34 RBI. In 1995, he played in 125 games batting .262 with a career-high 8 home runs and 55 RBI. Girardi was traded in 1995 to the New York Yankees for pitcher Mike DeJean. On May 14, 1996, Girardi caught Dwight Gooden's no-hitter. 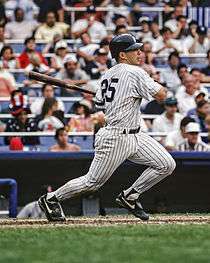 Girardi played in 124 games during the 1996 season, batting .294 with 2 home runs and 45 RBI. In Game 6 of the 1996 World Series, Girardi hit an RBI triple off of Greg Maddux that eventually led the Yankees winning the World Series for the first time since 1978. When the Yankees made 25-year-old prospect Jorge Posada his backup, Girardi became his mentor. The two catchers split time for the Yankees through 1999. In 1997, Girardi played in 112 games batting .264 with a home run and 50 RBI. During the World Series-winning 1998 season, he played in 78 games batting .276 with 3 home runs and 31 RBI. On July 18, 1999, Girardi caught David Cone's perfect game. During the World Series-winning 1999 season, Girardi played in 65 games batting .239 with 2 home runs and 27 RBI. In 2000, Girardi left the Yankees and returned to the Cubs, where he was named to that year's All-Star team, his first and only All-Star appearance as a player. (He was manager of the 2010 American League All-Star team.) During the 2000 season, Girardi played in 106 games batting .278 with 6 home runs and 40 RBI. In 2001, he played in 78 games batting .253 with 3 home runs and 25 RBI. On June 22, 2002, St. Louis Cardinals player Darryl Kile was found dead in his hotel room prior to a nationally televised game against the Cubs at Wrigley Field. Minutes after the game's scheduled start time, a tearful Girardi announced to the crowd that the game was canceled by Commissioner of Baseball Bud Selig "because of a tragedy in the Cardinal family", without mentioning Kile's death. Overall, during 2002, Girardi batted .226 with a home run and 26 RBI in 90 games played. In 2003, Girardi played for the Cardinals. He only appeared in 16 games with a .130 average and an RBI. Girardi retired from playing after the season was over. After a spring training stint with the Yankees in 2004, Girardi retired and became a commentator for the YES Network. He hosted the youth-oriented Yankees on Deck, received good reviews and was offered a larger role on 2005 Yankee broadcasts. But he rejected that offer, as well as an offer by Florida Marlins to become the bench coach with a guarantee to become the team's manager in 2006, although he subsequently got that job. Instead, he became the Yankees' bench coach. He managed a game during a Joe Torre suspension, a loss to the Kansas City Royals. Girardi remained the host of Kids on Deck in 2005, having shot his shows before spring training. During games, YES promoted Kids on Deck by showing Girardi sitting in the dugout during breaks in the game. Girardi worked games three, four and five of the 2006 World Series for Fox as part of the network's pregame and postgame team, along with host Jeanne Zelasko and regular analyst Kevin Kennedy. After fielding managerial offers for the 2007 season, Girardi instead came to terms with the YES network to return to the broadcast booth for 60-plus games as a Yankees analyst and co-host a new show on the network, Behind The Plate, with John Flaherty, also a former Yankee catcher. Girardi also served as color commentator for the No.2 booth (usually with Thom Brennaman) on Major League Baseball on Fox. After the 2005 regular season, Girardi was named the manager of the Marlins, replacing departed manager Jack McKeon. His first notable action as manager was to prohibit facial hair, a policy similar to that of Yankees owner George Steinbrenner. Girardi managed the team to a 78–84 record and a wild-card contention even though the team had the lowest payroll in Major League Baseball. At $15 million, the Marlins' 2006 payroll was lower than the salaries of several MLB players. However, Girardi was nearly fired in early August when he got into an argument with Marlins owner Jeffrey Loria during a game. According to witnesses and video footage, the Marlins owner was heckling home plate umpire Larry Vanover. When the umpire warned Girardi about the harassment, Girardi and his bench coach Gary Tuck then turned to Loria and told him to stop. Loria had to be talked out of firing Girardi immediately after the game. On October 3, 2006, the Marlins announced that they had fired Girardi, despite him winning 2006 Manager of the Year. Girardi said only that he appreciated the opportunity to manage the club. Girardi was thought to be among the leading candidates to replace New York Yankees manager Joe Torre after they lost in the 2006 American League Division Series, but Torre remained with the team. Girardi was also a candidate for the Cubs' manager position, to succeed Dusty Baker; he interviewed for the job just days after leaving the Marlins. With his playing experience in Chicago, he was considered a front-runner for the position. However, the Cubs chose to go with veteran manager Lou Piniella. Girardi took himself out of the running for the Washington Nationals' managerial job shortly thereafter and returned to the broadcast booth for the YES Network in 2007. He said taking another managerial job would have meant a third move in as many years for his family. 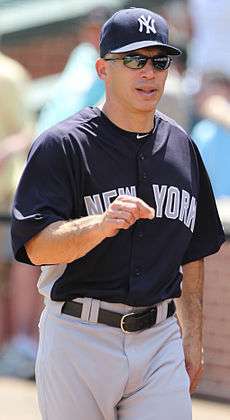 Despite Girardi's firing, he was rewarded for his achievements with the Marlins in 2006 with the National League Manager of the Year Award and Sporting News Manager of the Year Award for the National League. Joe Girardi with General Ann E. Dunwoody during the Yankees vs. N.Y. Mets game on June 14, 2009. In June 2007, after the Baltimore Orioles fired manager Sam Perlozzo, Girardi interviewed for and was offered the job but turned it down. When the Yankees' managerial position became vacant after the 2007 season, the Yankees interviewed Girardi, Tony Peña, and Don Mattingly. On October 29, 2007, Girardi was reported to be the Yankees' choice and the next day he signed a three-year contract, reportedly worth about $7.5 million. Girardi chose to wear number 27 to signify his wish to lead the Yankees to their 27th world championship. Girardi is a health enthusiast and has a ban on sweets such as ice cream and soda in the clubhouse. On August 2, 2008, Girardi participated in his first Old Timer's Day, the last such game played at the original Yankee Stadium. Girardi participated in the next Old Timer's Day on July 19, 2009, the first in the new Yankee Stadium, as well as every one since then. Girardi's first year as a Yankees manager was unsuccessful as the team was eliminated from postseason contention for the first time since 1993, finishing 2008 with a 89–73 record, 3rd in the AL East. In 2009, his second year as manager, the Yankees were a much improved team. He led the Yankees to their 40th AL pennant and their 27th World Series title (defeating the Philadelphia Phillies), his first World Series title as manager and the Yankees' first since 2000. Before the 2010 season, Girardi changed his number to 28. Newly acquired center-fielder Curtis Granderson had worn 28, but agreed to change his number to 14. Following the 2010 season, Girardi and the Yankees agreed to a three-year deal to keep him as the Yankees' manager. Some predicted that the 2011 Yankees would finish behind the Boston Red Sox due to Boston's high-profile free agency moves and the Yankees lack of action. The Yankees season was plagued by injuries that caused disabled list stints for several key players. Despite the setbacks, Girardi managed to lead the team to the AL East title. Rob Parker of ESPN commended Girardi's performance and felt his efforts were deserving of American League Manager of the Year, but felt he would not get the award due to the Yankees high payroll and what Parker alleges is an anti-Yankee bias. The Yankees were defeated by the Detroit Tigers 3–2 in the divisional round. On June 15, 2012, Girardi won his 500th game as a manager. Eventually, the Yankees reached the playoffs and defeated the Baltimore Orioles 3–2 in the first round but were swept by the Detroit Tigers in the 2012 ALCS on October 18, 2012. Girardi's 2013 season was marred by numerous player injuries and controversies, resulting in the Yankees finishing 85-77 (tied 3rd in AL East) and missing the postseason for only the second time after five years. On October 10, 2013, Girardi signed a four-year deal worth $16 million to remain as manager of the New York Yankees. In 2014, the Yankees finished 84-78, (2nd place in AL East) and did not qualify for the postseason for the second straight year. In 2015, a year the Yankees had low expectations, but finished the year 87-75, (2nd place again in AL East), clinching the top wild card spot which marks the team's first playoff appearance since 2012, but losing to the Houston Astros in the 2015 American League Wild Card Game. On May 21, 2016, Girardi managed his 1,500th game. Girardi and his wife Kim live in Purchase, New York, and have three children. Girardi is of Italian descent and is a devout Christian. While driving home after winning the 2009 World Series, Girardi stopped to help a car crash victim on a dangerous blind curve of the Cross County Parkway in Eastchester, New York. Police said Girardi put his own life at risk while trying to help the driver who had just crashed into a wall. The driver said she had no idea who Girardi was until the responding officers identified him. The next day, Girardi said, "I think the most important thing is that, obviously, there's a lot of joy in what we do, but we can't forget to be human beings when we help others out." On October 6, 2012, during the 2012 ALDS against the Baltimore Orioles, Girardi's father Jerry Girardi died at the age of 81. He had been battling Alzheimer's disease and spent the past several years in an assisted care facility. His mother had died from cancer while Joe was a student athlete at Northwestern University. ↑ "EP native Girardi fulfills a mission with Yankees". Pjstar.com (via The Associated Press). November 5, 2009. Retrieved July 22, 2012. ↑ "Meet A Prospect : Joe Girardi Edition". DailySportsPages.com. Retrieved 12 October 2012. ↑ Jack Curry (March 27, 1997). "Girardi Gets Turn to Play Big Brother". New York Times. Retrieved August 19, 2009. ↑ Cannella, Stephen (June 23, 2002). "Kile found dead in Chicago hotel room". Sports Illustrated. Retrieved July 22, 2012. ↑ "World Series Dreaming Remembers Darryl Kile". YouTube. Retrieved June 22, 2012. ↑ "Joe Girardi". TheBaseballPage.com. Retrieved 12 October 2012. ↑ "ESPN – Girardi returning to Yankees broadcast booth – MLB". Sports.espn.go.com. November 13, 2006. Retrieved October 11, 2011. ↑ Frisaro, Joe (January 27, 2006). "Girardi sets clean-shave policy". Major League Baseball. Retrieved July 18, 2011. 1 2 "Joe Girardi". Baseball Reference. Sports Reference LLC. Retrieved December 15, 2014. ↑ "Hardball Dollars". Russells.freeshell.org. Retrieved October 11, 2011. ↑ "SI.com – Zero hour – Sep 25, 2006". CNN. September 25, 2006. Retrieved May 6, 2010. ↑ Sullivan, Paul; Van Dyck, Dave (October 4, 2006). "Will Cubs Play Release and Catch?". Chicago Tribune & Los Angeles Times. ↑ Buster Olney (June 21, 2007). "Girardi declines Orioles' offer to take over team". Sports.espn.go.com. Retrieved October 9, 2012. ↑ "ESPN – Source: Girardi expected to accept Yankees' offer – MLB". Sports.espn.go.com. October 30, 2007. Retrieved October 11, 2011. ↑ "ESPN – Girardi agrees to 3-year deal to manage Yankees – MLB". Sports.espn.go.com. October 31, 2007. Retrieved October 11, 2011. ↑ "Girardi lands in Bronx, explains significance of No. 27". ESPN. Associated Press. November 2, 2007. ↑ Tyler Kepner (June 17, 2008). "Win Games, Eat Ice Cream". The New York Times. Retrieved July 18, 2010. ↑ Nightengale, Bob (November 5, 2009). "Title puts Yankees in 27th heaven, win Series in six". USA Today. Retrieved November 5, 2009. ↑ "Girardi on board as Yanks skipper through '13 | yankees.com: News". Newyork.yankees.mlb.com. Retrieved October 11, 2011. 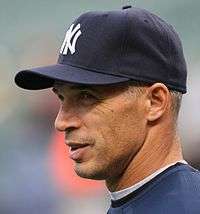 ↑ "New York Yankees – Joe Girardi deserves credit for Bombers' success – ESPN New York". Espn.go.com. September 22, 2011. Retrieved October 11, 2011. ↑ Brown, Tim (April 20, 2011). "Tigers dance atop vanquished Yankees in Game 5 – MLB – Yahoo! Sports". Sports.yahoo.com. Retrieved October 11, 2011. ↑ King III, George A. (June 16, 2012). "Yankees manager Girardi reaches 500-win plateau". New York Post. Retrieved July 22, 2012. ↑ Matthews, Wallace (October 10, 2013). "Joe Girardi re-signs with Yankees". ESPN. Retrieved October 10, 2013. ↑ Altobelli, Lisa (June 18, 2010). "Joe Girardi at peace with himself". ESPN.com. Retrieved July 22, 2012. ↑ "Girardi stops to help after Series win". ESPN. Retrieved November 5, 2009. ↑ "Jerry Girardi dies at 81". ESPN New York. Retrieved 11 October 2012.